Martha’s Vineyard is ringed by 27 saltwater and brackish ponds that are vital to the Island’s health, environment, beauty, and prosperity. Commercial Fishing: The ponds are productive sources of shellfish and fin fish, important to our commercial fishing industry. Water Recreation: The ponds offer a wide range of recreational opportunities, including boating and sport fishing, so important to the Vineyard's visitor-based economy. Shoreline: The ponds have more than 290 miles of shoreline, important environmental resources, favorite spots for beach activities, and prime locations for real estate and viewsheds for many to enjoy. The 16 great ponds (10 acres or more) and 11 other coastal ponds cover nearly 9,000 acres or 16 percent of the Vineyard. Excessive nitrogen is ruining the ecology of our coastal ponds. It comes largely from individual on-site residential septic systems throughout the watersheds of each pond, which allow nitrogen-laden wastewater to flow through groundwater into our coastal waters. The expense of correcting this situation will be enormous and we need to find the most cost-effective techniques. This section of the website gives an overview of Martha's Vineyard coastal ponds and how we can deal with deteriorating water quality due to nitrogen pollution. It is organized into the following sections. The Challenge outlines the main problems and what we can do about them. 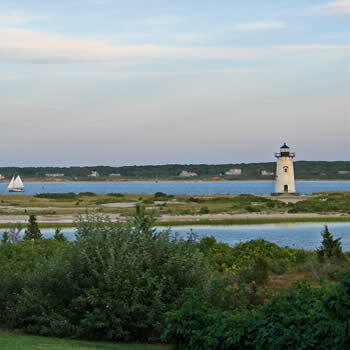 Ponds and their Watersheds provides basic information about each of the fifteen main coastal pond systems on Martha's Vineyard including the status of implementation of improvement measures and links to pond associations. Pond and Water Quality Data Reports provides access to many data reports and maps. Coastal Pond News gives updates on the latest information related to coastal ponds on the Island. Island Plan: Section 10 Water Resources of the 2009 regional comprehensive plan for Martha's Vineyard provides a useful summary of the situation and recommendations. Martha's Vineyard Wastewater Management Study: this was prepared for the MVC and the towns by in May 2009 by Wright-Pierce and gives a technical overview of the situation and a case study for each town. Martha's Vineyard Water Alliance: This informal grouping of public and non-profit organizations meets monthly at the MVC to share information about and to coordinate and advocate for efforts to improve water quality. Meetings are usually held on the second Thursday of the month at 12:15 p.m., but it's a good idea to check the calendar on this website before heading over. Wampanoag Tribe of Gay Head (Aquinnah) Natural Resources Department: The department does water quality monitoring, water testing, and environmental education across the Island and especially on and near native lands. Cape Cod Water Quality Initiative: In 2013, the Cape Cod Commission undertook an important effort to prepare a Regional Wastewater Management Plan, funded with a major grant from the Commonwealth, which will offer many useful lessons for the Vineyard. Massachusetts Estuaries Project: This effort is a collaboration between the Massachusetts Executive Office of Environmental Affairs and the University of Massachusetts's School of Marine Science and Technology to provide water quality, nutrient loading, and hydrodynamic information for 89 estuaries in Southeastern Massachusetts. More detail is provided in the Coastal Ponds and their Watersheds section of this website.